When the houseplant begonias become long, lanky and thin it is time to prune them back. This often happens while our plants overwinter indoors. They reach for the light, do not have any wind to strengthen their stems, and start to look puny. With just a quick cutback of stems to shape the plant, a top-dressing of good compost, and an outdoor summer in the shade, your plant will be thickened and beautiful in no time. If you would like to propagate more pots of begonias, fill out the original pot with more plants, or just share with friends, begonias are some of the easiest to root from cuttings. No need to use a soilless mix and rooting hormone, these plants want to grow. You can start them in a glass of water. 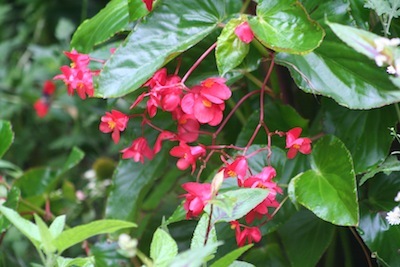 Keep the begonia cut stems cool and moist until you get them into a clear vase or jar of water. While you do your pruning, put the cut stems into a plastic bag lined with a soaking wet paper towel to keep them from drying out. Remove all but the top leaves from the cut off stems. Make sure you know which way is up since the cuttings will not root if you put the tops down in the water. This can be hard to discern if the leaves are gone from the cutting. A quick arrow on the stem with a marker will tell you which way is up if you are using a bare stem. Cut off and discard any thin, scraggly, floppy ends from the cuttings. Also, pinch off any flowers or buds. Use the sturdiest pieces you have cut off the plant. You want as strong a piece of stem as you can find with at least 2-3 nodes (joints). Trim the bottom to within a quarter inch of the bottom node. Long pieces of jointless stem that are underwater will rot. Put the trimmed stems, bottoms down, in a clear glass of water on a windowsill that gets good light, even sunlight. I like to use a Kitchen window so that I remember to add water as it evaporates. Clear glass containers seem to help the cuttings root faster. At least weekly, dump out the water and add fresh. When you add or put in new water, let the faucet spray it into the glass. This helps to aerate the water. Cuttings need oxygen in the water just like they do in the soil. Be careful not to use too much water force on the newly emerging roots. I like to hold the cuttings out of the vase while I fill it and then gently put them back into the fresh water. After roots form and are at least a couple inches long, pot them into good potting soil and keep them a little wetter than usual, letting them dry slowly so they transition to the soil from the water. Put a bow around the pot, add a gift card, and you have a perfect gift for any occasion.